← Self-directed learners at their best! And that was exactly what she did. She kept on practicing in her room, with her guitar, which she picked up very much on her own and even learned to write her own songs. But none of these really meant anything more than a good hobby. Until her songs started to get noticed by artistes and songwriters locally as well as from abroad through singing competitions and writing workshops (she raised her own funds for her Nashville trip this summer and spent two months there in Music City improving her songwriting craft). Her song “Goodbye” was selected to be included in the Rock for Ronan project to raise funds for paediatric cancer research in the U.S.
And now, the moment she has been working hard all these months for – the launch of her first studio-produced album is finally ready! The defining moment for her as a singer-songwriter will be evident for all to hear. 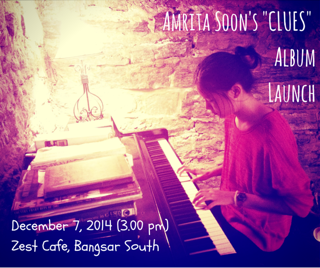 Do join us at her launch party where she and her friends will be performing their songs! This entry was posted in Activities, Programs and activities, Questions & Answers, Resource & Materials, Thoughts and Ideas. Bookmark the permalink.